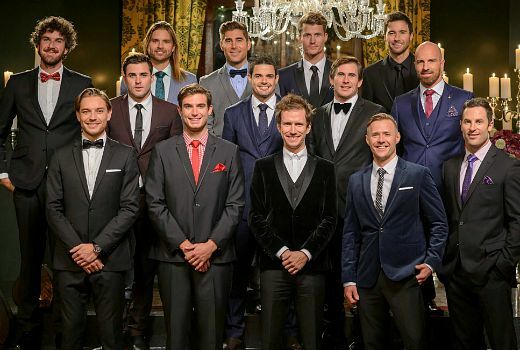 And here are the 14 single men competing for the affections of Sam Frost in first season of The Bachelorette. The series will premiere at 7:30pm on Wednesday, September 23 (The Bachelor grand final is Thursday 17th). There are 14 guys aged 25- 35, slightly fewer than the 19 women competing in The Bachelor. “I want to find a man who will love me for everything I am, and everything I’m not. I feel very blessed that these guys are willing to be vulnerable and put themselves out there for me,” said Sam Frist. Continuing her quest for love, is Bachelorette Sam Frost. After a nationwide search involving thousands of men, 14 Bachelors stood out from the crowd thanks to their intelligence, charm, charisma and humour. Ranging in age from 25 to 35, the Bachelors come from all walks of life and include a financial consultant, a professional football player, a plumber, a professional abseiler, a carpenter and a marketing manager. Over a series of extravagant dates, cocktail parties and nerve-racking rose ceremonies, will connections be formed and will romance blossom? Hosted by Osher Günsberg, The Bachelorette Australia will have all the romance, drama and laughter you have been waiting for, and much more. All walks of life but only one race. What’s a charity ambassador do to earn a living? The spin-off no asked for. Hate to pick you up, but there are comments even on this site back in 2013 asking for Bachelorette. I’m sure social media would have been similar. Such a diverse group there. We have a bald white guy, a bearded white guy and a white guy with long hair.